Luxury Log Cabin located on one of the largest properties, 1.74 acres, in one of Arizona's Finest Private Golf Course Communities! This Cabin has a pine log-sided exterior (each log is a half log) providing approximately 18'' thick walls that provides additional insulation. As you enter the home you are greeted with a warm and inviting great room with stone fireplace and two very large Aspen Wood Beams and high ceilings. Kitchen provides cherry cabinetry, large island, double oven, warmer drawer and spacious storage. The breakfast nook located off the great room with access to a very large deck with automated shades.Interior features include the master bedroom on the main floor with full bath that includes fine finishes including Travertine floors, Florida Cypress Hardwood, and Custom Alder Wood front door. Loft on second level provides the main master with very large walk-in closet, bath with jetted tub, custom shower, custom etched shower glass and dual sinks. Access to a private balcony and loft with fireplace and large seating area. Walkout basement includes large entertaining area with wet bar, pool table, guest bedroom, full bathroom, underground wine cellar, library, large office with built in desk for two and large closet. Step outside to the beautifully manicured landscaping that includes a dog run, waterfall and four-tiered pond, hot tub, artificial turf and relocated Indian Ruins. The bridge and path take you to a fantastic retreat for guests with the fully furnished Navajo Hogan. The Hogan offers an open concept that is complete with Native Dcor including: beautiful murals, custom beam ceilings, travertine floors, custom floor molding, beehive fireplace, two very well decorated bedrooms and one very large Jack & Jill bathroom. Complete full kitchen with sink, range, microwave and custom island made of AZ Brown Stone. 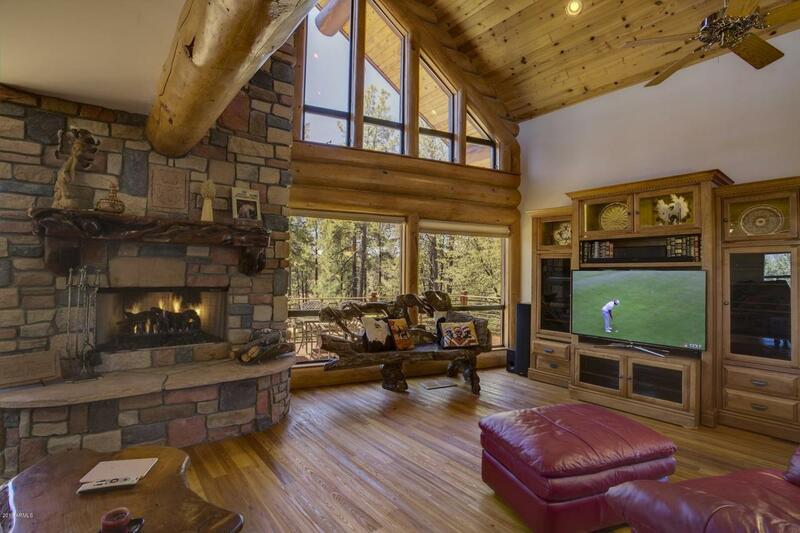 This home is a one-of-a-kind and has many possibilities to fill any Luxury Cabin desire.